New York chefs John Villa and Josh Capon put on quite the tailgate party on Sunday during the New York Giants home game against the Dallas Cowboys. 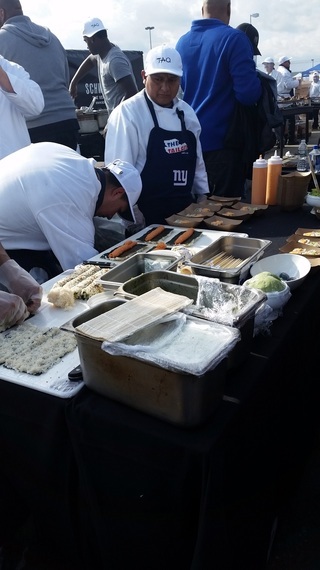 The dynamite duo served up Tao, Lavo and Bowery Meat Company favorites at the annual Tailgate with a Cause fundraiser, benefiting Tom Coughlin's Jay Fund Foundation. Coughlin's foundation helps families financially, emotionally and in practical ways when they are tackling childhood cancer. This year marked the ninth year Tailgate with a Cause has thrown this elaborate fete, each year choosing a different organization to be the beneficiary. "One of our board members, John Villa, has had an existing relationship with the Jay Fund and he hosts a golf outing in his sisters memory each year," said Dr. Brian Wraith, one of the twelve founding members of the organization. "And helping the families of children with cancer is really an easy thing to get behind." NY Giants fans, celebrities, and Tom Coughlin Jay Fund Foundation staff and families were in attendance, including Susanne Hennessy and her husband, Patrick. The Hennessy's son, Connor, has Acute Lymphoma Leukemia (ALL). Connor was diagnosed in January of this year and is now in the maintenance phase of his treatment which will end in April 2018. Susanne Hennessy offered,"My husband and I had a great time at the tailgate. The food was truly amazing. We could not say enough about the wonderful selection and taste of the food that was being prepared outside, right in front of us. I noticed Constantine from American Idol was there, and he actually grabbed the mic and sang. He also encouraged donations." "I don't have the final numbers yet, but I am confident that we will exceed $100,000 in donations collected," said Dr. Wraith when asked about the success of this year's party. To make the event even more festive, Sunday was capped off by Coach Coughlin's 100th career win with the Giants. Previous primary beneficiaries of Tailgate with a Cause include: NephCure, The Cystic Fibrosis Foundation, the Riley Sandler Foundation, Sarcoma Foundation of America, Little Miracles School (school for autistic children in Staten Island) and The American Cancer Society. To learn more about Tailgate with a Cause visit www.thetailgate.org and to learn more about the Tom Coughlin Jay Fund Foundation visit www.tcjayfund.org.